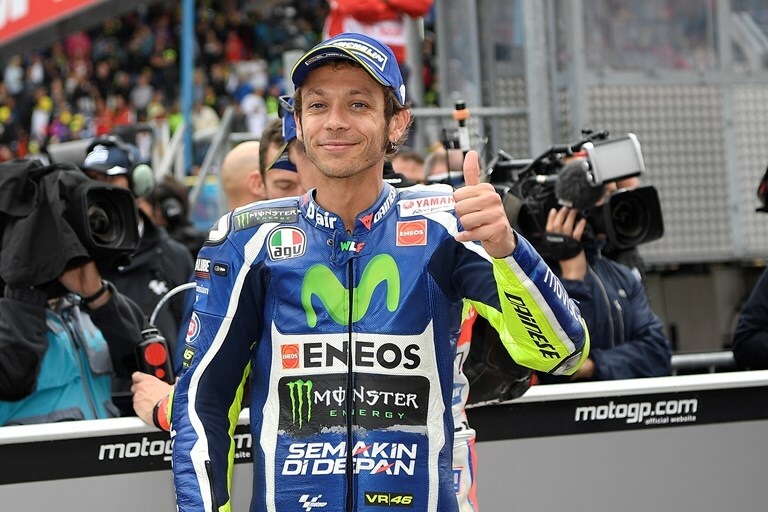 Movistar Yamaha MotoGP rider Valentino Rossi saved his best effort for last in today’s 15-minute qualifying heat to secure second place on the starting grid for tomorrow’s TT Assen. Teammate Jorge Lorenzo was looking competitive in the early stages of Q2, but was unable to acclimatise to the tricky and changeable track conditions and finished in eleventh position. Movistar Yamaha MotoGP rider Valentino Rossi judged the grim conditions at the TT Circuit Assen track exactly right during the Q2 session and dropped a strong final lap to start the Dutch GP from the middle spot on the front row. Teammate Jorge Lorenzo was unable to ride the hot lap he had in mind and will start tomorrow’s race three rows further down the grid. Rossi had been posting competitive times in every session and various types of weather so far this weekend and, despite this afternoon’s treacherous track conditions, the Q2 session was no exception. The Doctor followed his usual procedure of letting the other riders go out on track before him to be assured of some clear space. Once he completed a very careful out lap he put the hammer down and set a 1’49.662s for third place. His following two attempts didn’t gain him any places and, with four minutes of the session left, the Italian decided to come in for a fresh wet rear tyre, despite a dry line forming on track. His decision paid off; after a minute he was ready to hit the track once more and set a brilliant 1’45.961s for second place, 0.715s off the fastest time. Teammate Lorenzo had suffered a crash in FP3, luckily without any major consequences, and was able to take part in the afternoon sessions without any trouble. With the FP4 session being the only time the team had been able to test the wet set-up, the Mallorcan was also eager to go out at the start of the 15-minute long Q2 session. He was the first man to leave pit lane and set a 1’51.016s lap for provisional pole before dropping down the order to fifth place as the other riders completed their first lap. Over the next ten minutes of the session he continued to better his time gradually, but was unable to climb up the ranking until the very end of the session. Struggling to find a good feeling on the slowly drying track, that still had damp patches in various corners, he was in twelfth position but was determined to make his final attempt count. He gave one final push after the flag went out and improved on his own best lap by 1.289s with a 1’47.897s to take eleventh place. Monster Yamaha Tech3 team rider Pol Espargaro undertook an impressive qualifying campaign at the Cathedral of Speed and will kick off tomorrow’s highly anticipated race from 7th on the grid. The young Spaniard began the day by completing the morning practice in 12th after suffering a fall midway through the session, which prevented him from progressing to Q2, which he missed by only 0.073 of a second. However, rain fell just before FP4 where Espargaro battled onwards then, in QP1, he launched into action and notably finished first to progress through to qualifying 2. Here, he continued his efforts and after topping the time sheets early in the session, the Spanish rider pushed further and cut his time again, before completing the shootout in 7th by the time the chequered flag fell. Now the 25 year old keenly awaits the GP tomorrow where he aims to seal the top independent rider honours. On the opposite side of the Monster Yamaha Tech3 pit box, Bradley Smith fought against the elements at the historic Dutch circuit and will begin the 8th round of the World Championship from the fifth row of the grid. The young Briton kicked off his day by continuing his setup work from yesterday before finishing the morning session in 15th, which confirmed his attendance in Q1. Here, Smith got straight to work as he battled against the tricky conditions and he built up his pace as the minutes counted down, before setting a personal best on his penultimate lap. Nevertheless, the 25 year old optimistically looks on to the race tomorrow where he intends to clinch a solid point scoring result.